So you want to sport a snazzy, stylish haircut, but you also want to come off as professional. And at the same time, you want a style that reflects your personal style. How do you meet all of these demands simultaneously? Or maybe you want a conservative cut for a different job-related reason. According to the Kaiser Family Foundation, in 2015, 39% of Americans were employed in white collar jobs. If you’re one of these workers, chances are you have to follow a dress code, and hairstyles are often mentioned in such codes. Whether it’s for personal or work-related reasons, finding great-looking business hairstyles can be difficult, especially if you don’t know what to look for. 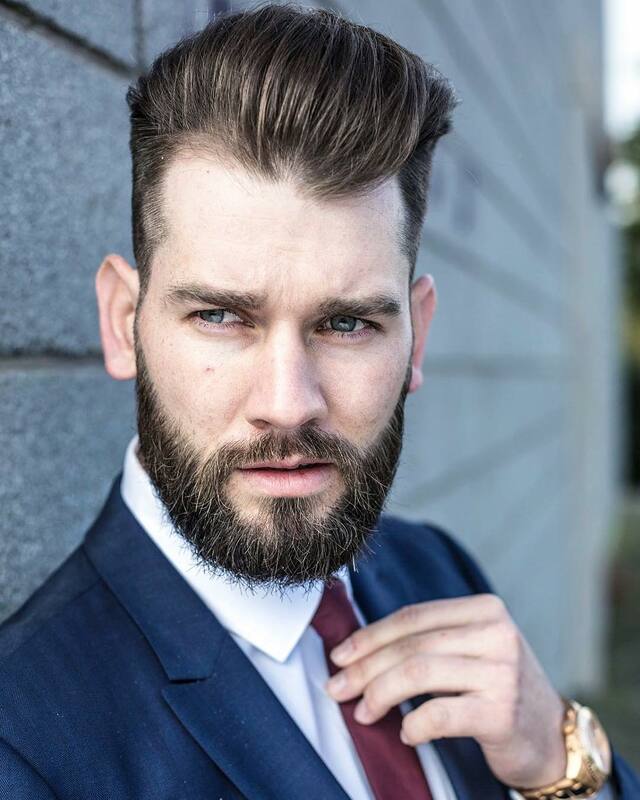 To help you out, we’ve put together a list of of our favorite business hairstyles for men and a few notes on what makes these haircuts stand out. Traditionally, many office jobs have required more conservative haircuts in order to maintain a well-groomed appearance among the staff members. Recommended haircuts are typically anything from super-short crew cuts to a slightly longer cut like the Ivy League or classic taper haircut. When fashion-forward men enter the workforce, they might find it difficult to abide by company code and find a style that suits them at the same time. Of course, not every white collar worker wants a mohawk, but some men crave a more stylish hairdo that fits the confines of a traditional business hairstyle. Conservativeness: This doesn’t have to mean “plain” or “boring.” The aesthetic of the business hairstyle is often more laid-back and nondescript, but it can still be stylish. In other words, a mullet with a spiky top would be a bad business hairstyle. Cleanness: Good business hairstyles are nicely and closely trimmed around the edges. The cut is even, and the haircut looks tidy. This is often the result of the barber or stylist who’s cutting your hair, so make sure you choose a reputable stylist. Versatility: This might seem counterintuitive at first, but a true business hairstyle can be worn in a wide range of situations. It should be appropriate whether you’re heading to work, having dinner with your family, or attending a prestigious ceremony. Many guys choose business hairstyles for their flexibility. If you’re having trouble finding a good style, we’ve compiled a list of cuts that meet all three of the above criteria. There’s plenty of different sizes and shapes for you to choose from, so whether you’re a fan of the classic, early twentieth century style or a no-fuss, shorter style, you’ll find something here to love. Also commonly referred to as the “businessman’s haircut,” the classic taper haircut is a timeless style that’s perfect for any job. It strikes the fine line between stylish and professional, and it does so effortlessly. The smooth taper and length on top of the head create a nice contrast that’s ideal for all hair types and face shapes, including guys with round faces. It’s a style you’ve most likely seen other guys sporting, and it’s common because of its simplicity and classic appearance. The classic taper haircut is easy to get, and you can vary the length to your liking. To learn more, read our guide to the classic taper haircut. If you like the crew cut style but want a little extra length on top, go for the Ivy League cut. It’s almost always paired with a side part, which is one of the trademark elements of a stylish businessman. Like the classic taper haircut, the Ivy League features a taper that adds a touch of cleanliness to the style. It’s also a nice low maintenance haircut that’s ideal for those busy weekday mornings. You can get up and go with minimal hassle and still have a professional hairstyle that looks sharp. If you dig the slicked-back, traditional look that’s been popularized recently, then you can’t go wrong with this style. It combines a striking, defined side part with a glossy shine to make a dapper cut. A high quality hair product is the key to achieving this look. Apply some gel or, preferably, pomade to your hair and work it evenly. This will give it the glossy shine. Then comb your hair to one side, creating the part, and comb the hair below the part ina downward direction. This is one of the classiest business hairstyles, and it’s a wonderful match for any office job (or any job, period). This professional men’s hairstyle is trending now, and we suspect it won’t be going out of style anytime soon. If you have curly or wavy hair, you might find it difficult to find a good style that’s suitable for work. A mild or short pompadour could be the answer you’re looking for. Pompadours are generally thought of as more eye-catching haircuts, with Elvis Presley’s pompadour as a notable example. However, a short and tight pompadour can tame curly or wavy hair and give you the clean, professional look you’re after. When working with curly or wavy hair, using good hair products is key to a tidy style. Look around for a product that meets your needs and works well with your hair type. Rounding up our collection of stylish office hairstyles, the butch cut is a solid option for any working man. It’s a shorter style, but it provides a clean, uniform look that’s right at home in the office. The butch cut is ideal for guys who don’t have the time to style their hair. And if you like a cut that’s not super short or super long, the butch cut also works for you. You can even do it yourself at home to save both time and money in addition to getting a nice, work-approved hairstyle. This is also a nice choice for men with curly or wavy hair. You’re essentially cutting off all the curls or waves and leaving yourself with enough hair to give a more straight, clean look. So if you find it difficult to tame your hair, try a butch cut. And remember, you can change the length (based on the clipper setting) to your liking. Take a look around at the look different clipper settings produce, and decide which one you prefer. For more info, read our guide to the butch cut. Short but sweet. The trimmed, close-cut Ivy League will fit in at school or work while remaining casual for after-hours relaxing. This fashionable combo of a side part and slicked back hair will up your cool factor. Pair with a fade on the side for a high-contrast look that shines. You can’t go wrong with a classic taper haircut. You can wear the basic style or experiment with it to make a style of your own. This taper haircut will give you style at the office. The fade can be gradual or dramatic, and either way, it isn’t dramatic. The side part is a timeless gentleman’s style. Comb your hair to the side for a natural part or get a hard part to stand out from the crowd. The time-tested butch cut doesn’t have to be a boring look. Add some personality to it and take it to the next level while staying business-friendly. The crew cut is both business-casual and utilitarian. If you find yourself exercising or going outdoors often, a crew cut will be your best friend. This slicked back taper style is dapper yet conservative, toeing the line but keeping the balance. A high contrast cut that doesn’t impose, this style is a great choice for any business setting. We love all kinds of variations on the Ivy League because of the style’s versatility. If the crew cut is too short for you, try out an Ivy League. If you like parting your hair, check out this side part variation. Classy and refined, this side part is simple to sport but says a lot. Try this close cut on for size. It’s subtle from a distance but becomes more noticeable at a closer look.